A healthy immune response is vital for preventing infection and disease. 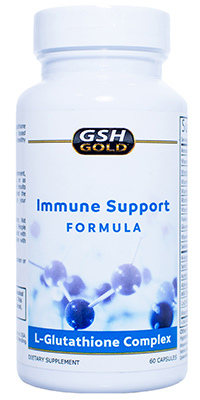 GSH Gold uses powerful immune boosting antioxidants to fortify the body’s natural immune response. Our body is in a constant state of repair, it plays an essential role in our growth and development. Using scientifically chosen ingredients, GSH Gold helps to optimize this repair process. Detoxifying our body and supporting optimal cellular function. GSH Gold is committed to quality. We only use top quality ingredients and avoid the use of any fillers, dye’s or proprietary blends. We stand behind our ingredients and put them front and center. You won’t find a better formula anywhere. L-Glutathione is the body’s master antioxidant, present in every living organism on the planet. It plays a key role in the detoxifying process, ushering toxins from the body. Supplementing L-Glutathione levels is important for virtually everyone, as so many factors deplete our Glutathione levels. Supporting Glutathione levels can help enhance the body’s natural immune function, cellular health and energy production. 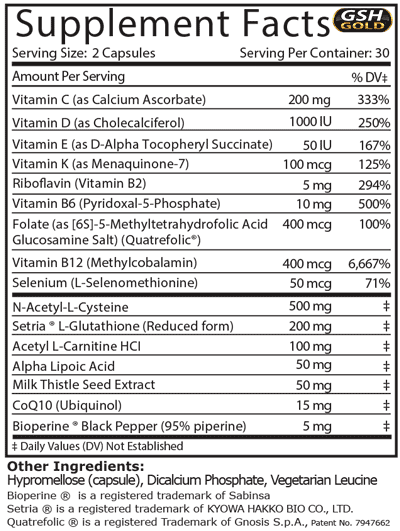 With over 100,000 studies done on this miracle antioxidant, the benefits are nearly limitless. L-Glutathione has earned its title as the body’s most powerful and vital antioxidant. GSH Gold helps to improve Glutathione levels through three distinct pathways. Directly enhancing Glutathione levels with L-Glutathione. Promoting natural Glutathione production with proven effective precursors. Improving the body’s methylation cycle with a specially formulated vitamin complex, helping to recycle oxidized Glutathione back into its active form.